Keeping your baby’s mind engaged is so important. The main reason you’ll want to do this is so your baby stays entertained and doesn’t get bored. However, more importantly, engaging your baby’s mind will help to improve their mental development. Thankfully, this level of engagement isn’t as hard as it may seem. With the introduction of a play mat, you can prevent boredom while guaranteeing your baby always has a smile on their face. What’s more, these mats are perfect for occupying your child while you carry out your daily tasks. To help you narrow down your search, I’ve taken the trouble to explore a vast range of play mats. From my discovery, I’ll now share three of the best available. This allows you to save time when it comes to finding the best play mat for your family. I’ll start with my absolute favorite. 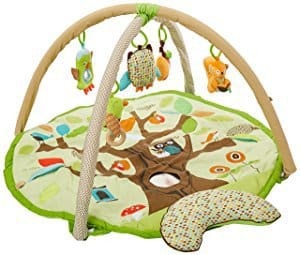 As you can see from the name, this unique and engaging play gym is a 5-in-1 setup. That’s everything you and your baby could ever possibly need. Suitable for newborn children all the way through until toddler age, this one-size-fits-all mat is ideal for any family home. 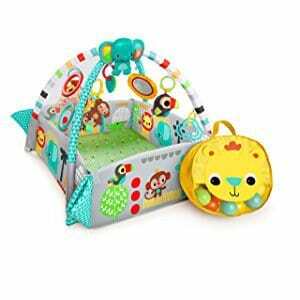 This large-scale jumbo play mat is completely customizable and comes with a collection of stimulating toys that your baby will instantly love. There are bead-chasers, plush cuddly toys, crinkly fabrics and so much more. It’s almost guaranteed that your child will never get bored. There are 35 child-friendly balls included so you can convert with activity mat into a fully-featured ball pit. What's Great About It: One of my favorite features is the adjustable walls. Around the outside of your play mat, you’ll find a safety wall. These walls can be erected to create a safe and enclosed play environment for your children. Alternatively, you can lower them to allow your child to wander in and out as they please. Suitable for newborns and above, the Skip Hop Activity Gym is a sensory haven. Within this gym, your kids will be able to enjoy 17 unique developmental activities, each designed to enhance your child’s learning skills. On the overhanging frame, your kids will be fully entertained with the five lovely hanging toys. These toys are designed to stimulate your baby’s brain visually. As you can see, the entire set is inspired by a nature theme. This is evident from the graphics and the theme printed on the comfortable and supportive fabric mat. What's Great About It: In addition to all these features, this activity gym only takes two-minutes to set up. That means setting up is a minimal hassle and stress on your behalf. It also means your child can stay enjoying this set almost immediately. To conclude my list of favorites, I’ve opted for this outstanding set that brings a unique edge to play gyms. With this mat, your child can enjoy five unique activity toys that are hung from the overhead bar. These toys are specially designed to boost your child’s sensory development while they play. Your baby can lie on their back or on their tummy, always giving them the comfort and support they need. Additionally, there are several other toys. These include a hippo teething toy, elephant-themed clackers and more. What's Great About It: Alongside this exclusive piano feature, there’s also a collection of built-in sounds. There are long and short songs to choose from. These songs can help to relax your child or send them off into a well-deserved sleep. With so many activity gyms available, it can be difficult to know which one is best for your little one. To ensure you’re making the right decision, here are a few considerations to bear in mind. When choosing your preferred play mat, always check the manufacturer’s guidelines regarding age. This is because some play mats may only be suitable for certain ages and above. These mats may contain small pieces that can cause a serious choking risk to smaller children. Size does matter, so your chosen play mat should be least twice the size of your baby. This is because your child won’t be stationary while using the mat. With the extra space, your child will be free to roll, crawl and move around with a minimal risk of them falling off the mat. With most mats, they should be set up on a firm, supportive and flat surface. 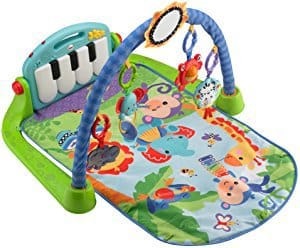 A play mat can also be used as the ideal surface for teaching your baby how to walk, as your child will be able to fall over without risk of injury. As a rule of thumb, the cheaper your chosen mat, the less interactive features it will have. When searching for a mat, the more features it has, the better. This is so that your child can use the mat without getting bored. More features will also mean that your child can enhance their development. This is because there’s more to engage your child’s mind during play time. A baby gym mat is the ideal toy for entertainment and development. Take your time when choosing the perfect mat for your little bundle of joy to ensure you’re buying the right one. The right choice will make the world of difference between wasting your money and giving your child the best start in life.